Support for those less fortunate than ourselves has been a feature of our Masonic activity throughout the history of this Province. In the eighteenth century , charity was disbursed by individual Lodges on behalf of their members. In 1815, Grand Lodge ordained that a Province could establish a Local fund for charitable and other Masonic purposes, and then, in 1853, a meeting of Provincial Grand Lodge in Blackburn established a Fund of Benevolence. Eventually a Committee was formed to promote the interests of charity. This Committee included one representative from each Lodge in the Province. This was the origin of the Lodge Charity representative, now known as the Charity Steward. In 1876, “The East Lancashire Systematic and Educational Masonic Benevolent Fund” was established to administer the increasing work of helping needy Masons and their families in the Province. In 1904, the Institution was incorporated and registered under the Charities Act, and became ” The East Lancashire Masonic Benevolent Institution (Incorporated)”.The Constitution of ELMBI has stood the test of time. It has served this Province for over a century. During that time, through the work of Lodge/Chapter Almoners and the Committee of Benevolence, it has been able to improve the quality of life of thousands of its beneficiaries with its charitable care and support. But that would not have happened without the generous donations of the Brethren of the Province, facilitated by Lodge/Chapter Charity Stewards. In recent years, the focus of this Province's charity has been diverted into various Festivals, reducing ELMBI's capability and profile. The Provincial Grand Master at his Installation set the reversal of this as one of his priorities. It is up to the Brethren and particularly the Charity Stewards to meet this challenge. In response to this initiative we have re-branded our Charity by changing its name, logo and presentation to give it a 21st century image. This is supported by a new website to communicate to Brethren and the public what we do. Charity Stewards are asked to address their Lodge/Chapter from time to time to increase awareness of the East Lancashire Masonic Charity amongst their members, and to remind then of their commitment to contribute. 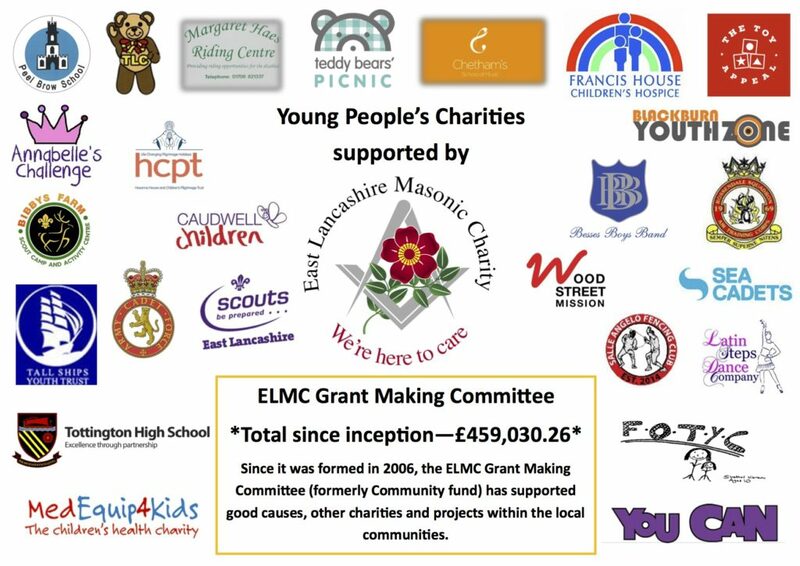 As the financial strength of the East Lancashire Masonic Charity is restored, not only will we be able to give more support to the needy of the Province, but we will also be able to reach out to other non-Masonic Charities in the communities in which we live and generally raise our profile for the good of Freemasonry in this Province. The Charity is the central vehicle for the delivery of Masonic charity and care on behalf of Freemasons in East Lancashire. It augments the charitable work of Freemasons in their Lodges and Districts by supporting those in need within the wider Masonic “family”, eligible projects which benefit local communities and other good causes. The relief of poverty by the provision help and assistance to needy Freemasons, or their widows or any other of their dependent relatives, living predominantly but not exclusively in East Lancashire. The education of children of needy or deceased Masons. To make grants in cash or kind for the purpose of relieving the immediate and pressing needs of Freemasons or their families who live predominantly but not exclusively in East Lancashire. To provide help and assistance to other charitable and good causes for the general benefit of the public or communities situated predominately but not exclusively in the East Lancashire area.